FLEX Importance: I always say that FLEX is a lifetime experience. I truly believe that this exchange brings an X change to everyone individually. For me that X is ‘charity through volunteering’. During my FLEX year I was involved in a number of volunteer programs. As a volunteer I helped build houses in Chicago (Habitat for Humanity); taught in Sunday School at the St. Mesrob Armenian Church in the U.S.; interpreted for World Vision USA; helped organize the first FLEX tour for disabled students of Pyunic Disabled Association (Armenian Association for the Disabled) and interpreted for human right defenders during an International Conference organized by the International Foundation of Human Rights. Since I had volunteered for over 100 hours during my exchange year, I was honored to receive a pin and a certificate from the U.S. President and the White House. I am a dreamer and a doer and I think that in general charity requires both. This is who I have become because of FLEX and that’s why FLEX is extremely important to me! FLEX Lessons: My skills were enhanced during my U.S. year. I became more mature, learned how to make independent decisions and acquired different types of knowledge. The most important skill, which I gained during my FLEX year is the notion of volunteering! And I am so thankful to FLEX for introducing me to this great idea – exchanging your time and abilities for a feeling of spiritual fulfillment and appreciation! When I think of meaningful volunteer experiences, the first event that comes to my mind is a soup kitchen for homeless people, which was organised in my American town of Racine, WI and the St. Mesrob Armenian Church. It turned out to be an emotional experience for me as I did not know what to expect and was even scared at the beginning. But then I got to know a lot of people individually, listened to their life stories and my stereotypical idea of a homeless person ‘crashed’. Their smiles gave me energy and made me feel helpful. Current Work: I am currently the head of inbound marketing at iNexxus Digital Branding Online Marketing Agency. My marketing team and I carry out projects for our clients offering them a wide range of services ranging from SEO (search engine optimization) to SMM (social media marketing) and online advertising. 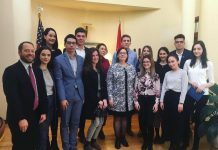 I am also taking part in eTEMP ‘Exchanges to Entrepreneurship Mentoring Program’ organized by American Councils in cooperation with the US Embassy in Armenia. This program aims to foster business initiatives in Armenia through pairing FLEX alumni with alumni of all USG programs. I am excited to learn as much as I can and enhance my professional skills through this experience. 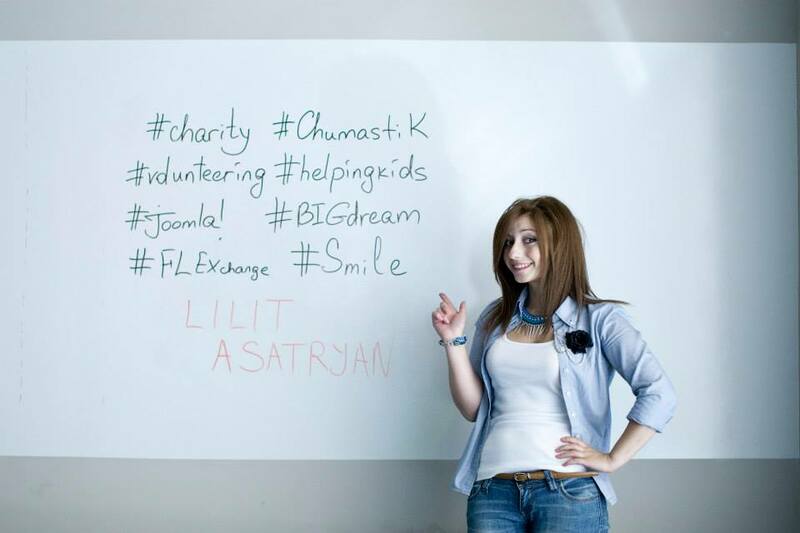 Since November 2011 I have also been working as a Co-founder and voting core member at the charitable NGO Help Armenian Children. We carry out fundraising events in order to help children with serious health issues and those from low-income families and raise awareness of protection of child rights. I mainly deal with an international section of our NGO, which is responsible for developing contacts and expanding outside of Armenia. 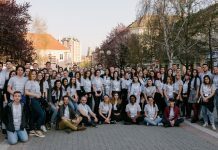 We currently have many young people from different parts of the USA and Russia, who spread the same ideas and work for similar causes in their respective regions. Past Highlights: I love working for our NGO. We initially started as a Facebook group, but then gradually organized more and more events in order to reach more children. In 2011 we felt the need to found a charitable NGO. 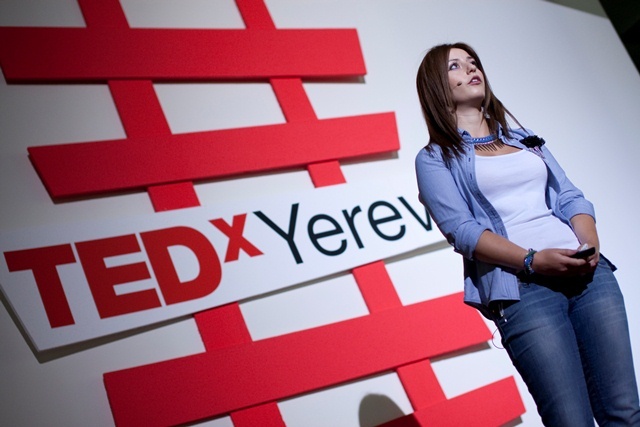 Another personal success was presenting my dream at a TEDxYerevan Conference with the theme ‘Entrepreneurship of Big Dreams’. 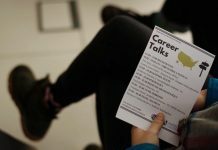 Right after my TEDx talk, I received a lot of feedback – different people were reaching out to me via e-mail, social networks, and over the phone. They were all willing to help. One of them was Sarko Meene, a very talented artist. We met, she showed me her paintings, and we decided to organize a silent auction for a good cause. The event took place at the Green Bean Coffee Shop, which was coincidently owned by one of my fellow TEDx speakers, Irina. On the day of the event we discovered that both Irina and Sarko also turned out to be FLEX alumni! The event was a big success. The money raised from the auction was transferred to the bank accounts that were set up for four children with serious health issues. This funding allowed them to continue and further their treatment. In the past I also worked as an SEO-focused Content Manager and Social Media Marketer at Bang2Joom. I was writing content for Bang2Joom and all of the partner websites as well as leading social media marketing campaigns and promoting Bang2Joom’s work on different social media platforms. Current concerns: One of my main concerns is related to the issue of child protection. I am committed to the welfare of young people. Children are the most important part of our society. They are the ones who are going to make our future and they have to be healthy to build a healthy future. Children are also very vulnerable and need to be taken care of. Sometimes they are not receiving their basic human rights. It is very hard for me to sit back and watch and wait until child protection laws start working. The right thing to do is to act in order to help these children with whatever you can now. Message to FLEX alumni: I am sure that FLEX has a hidden X idea for every one of us. Try to define the X for yourself, move towards it and you will eventually reach it. Be flexible as this is the time to start your real FLEX experience with a ‘treasure chest’ of skills that were acquired during your exchange year! Rock it!